A little further afield, but ideal for a day trip, are the following cities. An hour’s drive from Perticara (70 km) lays Ravenna, an ancient city famous for its many mosaics. Eight early Christian buildings in Ravenna are on the UNESCO world heritage list, with the octagonal basilica of San Vitale, built between 526 and 547, being the high point of Byzantine architecture. It is not without good cause that the famous Italian writer, Dante Alighieri, who is buried next to the basilica of San Francesca, described the mosaics in his La Divina Commedia (1321) as a ‘symphony of colours’ – the reflection of the thousands of golden stones creating an impressive spectacle. Funny story: You know when you are a bit short of space at the end of a line of writing? And you squash the words in or go round the corner in an attempt to fit the text in. Well, you can also see that same problem in the Basilica of San Vitale, where the artist had the same problem with putting in the names of the twelve apostles as mosaics. They didn’t fit! 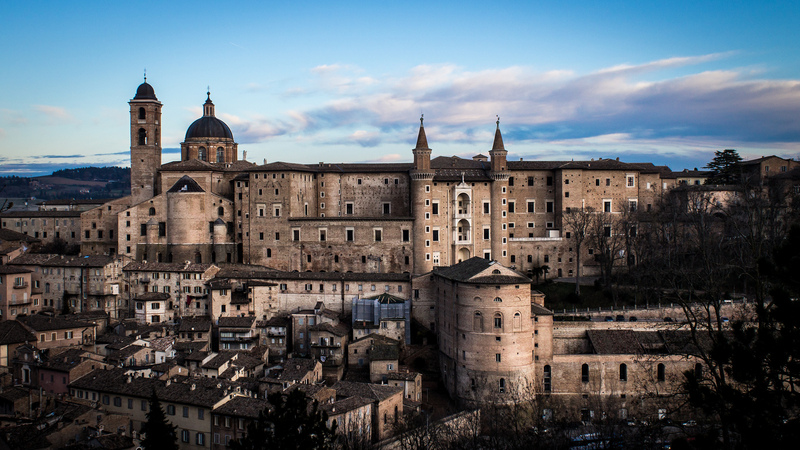 A little bit further away from Perticara, about an hour and a half’s drive away, is the historic university city of Urbino. Roughly a third of inhabitants are students, which creates a great atmosphere. The university summer school gives Italian lessons and the Piazza della Repubblica, the heart of the city, forms the perfect stage to put the lessons into practice. Around the square are lots of tiny streets – some very steep – with lovely little shops and boutiques. Fortunately you can wander peacefully around, as there is very little traffic: visitors have to leave their cars outside the city walls. Urbino has the Duke of Montefeltro to thank for its development, as he governed the city from 1444 to 1482. This Federico was not only very rich, but also a great art lover. He built the Palazzo Ducale, using many famous artists and architects of the time. The façade with its various, staggered loggias served for a long time as the monumental entrance to the city. Also to be found in Urbino is the birthplace of the painter, Raphael. Anyone wanting to view his work would be best to buy a ticket for the Galleria Nazionale delle Marche, situated in the Palazzo Ducale. This museum has one of the most important collections of Renaissance paintings in the world, and is definitely worth a visit. When leaving the city, take the rampa: a tower from the 15th century with a spiral staircase. It will take you back to the car park. Known primarily for being the birthplace of Francis of Assisi, a wonderfully preserved city with a number of beautiful churches, cloisters and houses, its high point is the three level church of San Francesco. It can be pretty busy with tourists during high season. Read the Dutch booklet with a lot of information about our region. Pages 81 to 159 deal specifically with the immediate surroundings.